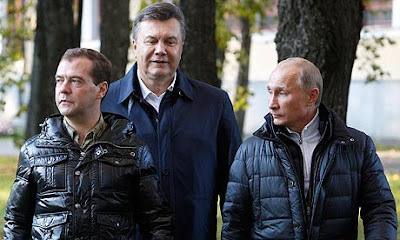 KIEV, Ukraine -- Ukrainian president Viktor Yanukovich is off to Moscow next week in his latest effort to secure economic support from his powerful neighbour, with a discount gas supply deal near the top of his list. Good friends out for a stroll - Russia's Medvedev (L), Ukraine's Yanukovych (C) and Russia's new President Putin (R). But Kiev’s financial needs are pressing: S&P on Thursday downgraded the credit outlook on Ukraine to “negative” while ministers talked of rescheduling $3bn in debts owed to the International Monetary Fund under a 2008 programme, even as Ukraine’s current programme has been suspended. No wonder Yanukovich needs Russia. With Ukraine heading for a balance of payments crunch, S&P’s downgrade came as little surprise. Ukraine is this year scrambling to cover or rollover nearly $6bn in external and about $3bn in domestic debt obligations. S&P revised its outlook on long-term foreign currency government bond rating to negative from stable, confirming the rating at B+. "We are revising the outlook on our long-term sovereign ratings on Ukraine to negative, reflecting our opinion that ongoing uncertainty about the Ukraine government’s negotiations with the IMF and Gazprom is increasing refinancing risks." "In our view, increased risk aversion toward Ukraine’s funding needs has been fuelled by the lack of clarity over the ultimate direction of government policy in relation to ongoing negotiations with the IMF and Russian gas company, OAO Gazprom." A responsible administration would be working for a resumption of the current $15.5bn IMF programme that was frozen last year due to lack of fiscal reforms. But instead, Yanukovich has recently announced $3bn in populist pension increases and other social handouts. It’s an obvious bid to win back voter support before the October parliamentary election. The added spending could increase the total national budget deficit (including the deficit of state gas company Naftogaz) from 5.2 per cent of GDP in 2011 to 8.5 per cent this year. That’s a big shift in the wrong direction at a time when other European countries are trying to trim deficits expanding in responding to the 2008 crisis. But boosting public borrowing doesn’t appear to be troubling Yanukovich, when the number he’s watching closely is his approval rating which has plunged towards single digit percentage levels since he narrowly beat Yulia Tymoshenko in a 2010 presidential contest. Despite the recent jailing of Tymoshenko on charges widely deemed to be politically-motivated, Yanukovich’s grip on voter support may be weak. Tymoshenko’s Fatherland party is out-polling his Party of Regions. But it remains unclear how Yanukovich will fund these social expenditure increases given that he has increasingly alienated the IMF, the European Union ( a potential source of financial aid as well as a trade partner), and Russia. Yanukovich could squeeze more taxes and fines out of businesses, something done in the past. But this would also hurt him in the polls. He could borrow on international markets, but it would be expensive. During his first two years in power, Yanukovich has failed to broker a deal with Russia’s Gazprom that would bring lower gas prices. Sensing Kiev’s weakness, Gazprom has, in return for cutting prices, demanded control over Ukraine’s strategic gas transit pipeline. But handing it over could be political suicide. The IMF wants Ukraine to increase gas prices on households to compensate for the higher prices and bring more transparency to the nation’s murky gas sector. But such an increase would hurt voter support, and Yanukovich has recently declared prices won’t be raised. “An increasingly desperate government is looking for other short-term fixes,” London-based Capital Economics wrote in a March 15 note. But, in a sign of desperation, they said the country would ask the Fund to restructure, or refinance more than $3bn in IMF loan payments that have to be covered this year on previous borrowings. The IMF and market isn’t likely to agree. “The IMF is highly unlikely to approve Ukraine’s [recent] request to restructure $3bn of loan repayments due this year, but the fact that the government is even considering such a move demonstrates the extent to which it is running out of options,” said Capital Economics. With about $30bn in central bank reserves, the immediate risk of default is low. The public debt-to-GDP is ratio is not high – 38.9 per cent at end-2011. But populist policies means it is rising rapidly, with 43.5 per cent prospect by the year-end, according to JP Morgan. External debt redemptions will increase in 2013 and stay high over the follwoing two years. This is not a sustainable course.